And another, affixed to a tree on the edge of his property at Old Oak Cottage, says: “England was a proud country destroyed by scum, thieves and traitors.” Mr Kegg says he is ready to defy the authority, which will enforce the notice under anti-social behaviour legislation. 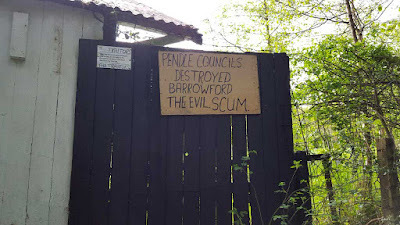 And he confirmed that his protest concerns the controversial decision to construct 500 homes at Trough Laithe, on the outskirts of Barrowford, where he grew up. He said: “I knew Arthur Pickles, who had the land. I knew his labourers and all the footpaths around that farm. We used to go sledging around there and got up to all sorts. Cllr Linda Crossley, chairman of the Barrowford and Western Parishes Committee, which approved the community protection notice, said the council always usually preferred to negotiate, when it came to such matters, but discussions had not proved effective. She added: “The signs are on a public right of way and they are offensive so this is what we are going to do. It was brought to our attention prior to our last committee meeting in March and we took advice from our officers.” Tim Horsley, the council’s community protection co-ordinator, added: “This notice would ultimately give the council the ability to enter the land and remove the signs.” Councillors have been told that Mr Kegg could appeal to the magistrates court to overturn the notice.